How to draw Death the kid. Learn to draw Anime Manga style character from video and step by step images with instruction. In this tutorial, we will show you how to draw Death the Kid from Soul Eater Anime series in a more hyper realistic Anime style. 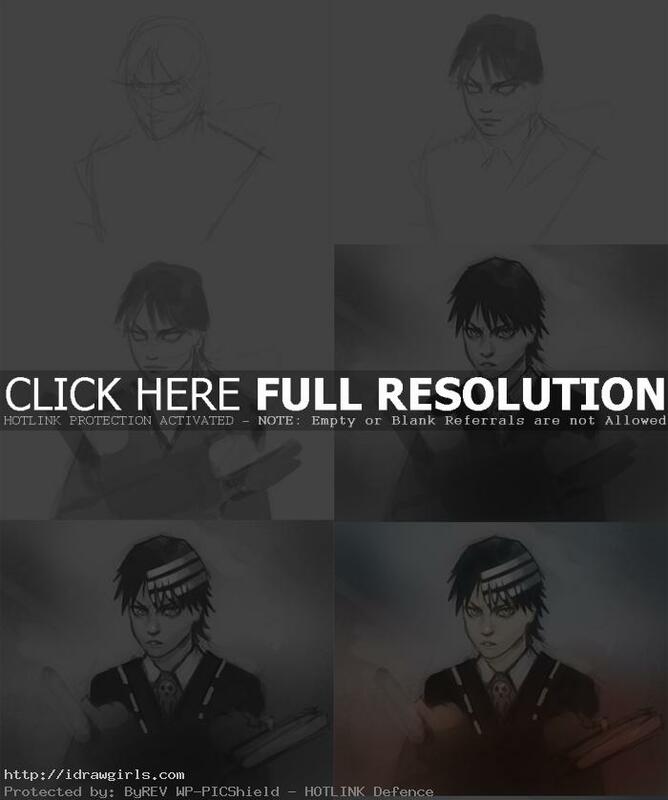 Draw and Color Anime Soul Eater Character Soul Digital painting Tutorial. Draw and Sketch Manga character, Soul from Soul Eater Anime Serie. Demonstration of Manga tutorial drawing Anime guy character illustration sketch. Learn from Step by step and video tutorial. This one is focusing on portrait and upper body of a male character design for Anime, video game, and Manga. The process shows drawing and sketching video series of Anime Manga characters that will help you gain knowledge of anatomy and dynamics in the positioning of the figure and the details. About the character:Death the Kid (デス・ザ・キッド) commonly called “Kid” (キッド) by his friends and family, is one of the three main meisters that the series follows. He is Patti and Liz’s meister and Shinigami-sama’s son. He is established early on as a very powerful character and though he continually gets stronger as time progresses, he is often more of a comic relief character. Kid suffers from obsessive-compulsive personality disorder, or OCPD, which is represented as an obsession about everything having to be perfectly symmetrical and takes the idea of perfection to the extremes. To him, anything symmetrical is beautiful and if it is off by any measurement (a picture frame off by millimeter, or a pose that is slightly out of place), he will try to correct it right away, even if the situation calls for utmost attention. His favorite number being 8 because of its symmetry. He is so obsessed with symmetry that Kid refuses to fight a battle unless he has both Patty and Liz together as they would not be symmetrical apart. The biggest problem Kid has is with his hair, because the left half of his bangs are marked with three white stripes. Here is a final drawing with color of Death the kid from Soul Eater Anime series. Watch video tutorial how to draw Death the kid. Below are step by step images to help you along with the video tutorial.